A couple of months ago we read about an oyster festival in Whitstable, which is about an hour and half outside London. Oysters = good. Festivals = good. Seaside = good. Excuses to go to random English towns = good. The executive decision to go to this festival had been made. 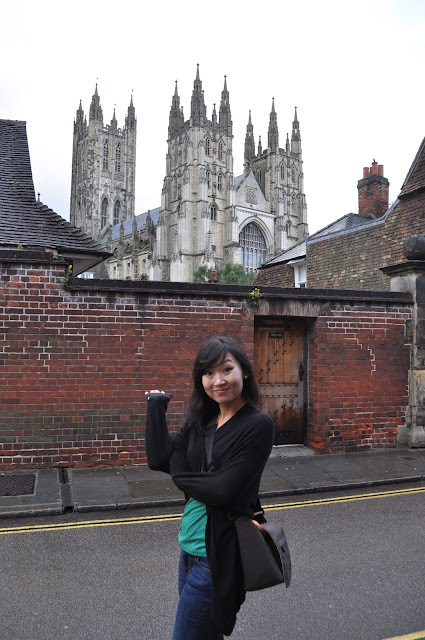 We chose to stay in Canterbury, which is a beautiful historic walled city and a short bus trip from Whitstable. Like most smaller English towns I've been to, it was so.....damn.... cute! Deesons. I'm going to be very British and say that we had a very nice dinner here. So nice. This courgette flower stuffed with crab mousse with an herb dressing was a delicately delightful starter. The Parrot is the oldest pub in Canterbury and one of the oldest buildings in the city, established 1370. It's also the perfect place for a pre or post dinner ale. The best (and yes a bit random) part of this pub is they have deeelicious barbecue wings! And as if that's not old enough, check out The Canterbury Cathedral, founded in 597. 597! It also easily dwarfs the rest of the town. But, let's focus on why we're here. The Whitstable Oyster Festival! Whitstable is an adorable seaside town just about 20 mins away from Canterbury. The first oysters came from a little stand by the sea at only £1 each (take that Borough Market!). I prefer both lemon and tabasco (and horseradish if available). I noticed many people were using shallot vinegar, which I didn't really take a liking to. Really still not sure what that was, but I wouldn't mind one of those Newfoundland dogs. After about a dozen oysters, we switched to a platter of seafood. Prawns, mussels, crayfish, cockles... and a deceiving fake lobster tail (bleh!). A couple of hours in Whitstable and you forget this is just outside London. It's these weekends which inspires me to travel more around England and the rest of the UK.